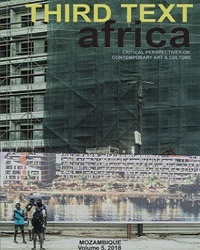 ReCenter references the centre-periphery debate, specifically questions of Africa’s representation in international biennale, and the need to develop African alternatives. ReCenter is a verb. To ReCenter is to move away from dominant models, and more importantly, to begin to develop alternative artistic practices, discourses, structures and systems of validation. ReCenter restores agency at a personal and community level, distinct from ‘decentralize’, which suggests a devolution of power led from the Centre. ReCenter engages critical issues such as inclusion and exclusion, the in/visible, the un/said and un/heard, power and powerlessness. ReCenter adopts an ‘American’ spelling. Languages of the ‘centre’ are also sites of struggle. And “enter” implies access. Ernestine White: Photography and its effects on the viewers perceptions of time, space or place has resulted in my life long interest in observing that which goes unnoticed, the mundane. From the all too often misinterpreted and ignored graffiti like markings on neighbourhood walls, doors and crevices to the ordinary objects which occupy our daily spaces. To the discerning eye there exists moments in which the mundane, the ordinary, has the potential to be transformed into the extraordinary. As an artist the medium of photography has always been an important element in my work. 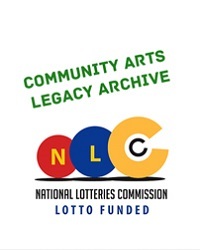 It has served as a tool to document,to serve as visual reference and even to inspire. In my recent body of work titled Banal Illusions I explore the relationship between the camera, myself and my immediate environment in an effort to begin to understand the role (power) one has in altering one’s perceptions of reality. At first glance, the ordinary objects all serve a specific human purpose; they are objects that signify a human presence. By photographing details of objects that occupy the spaces of my everyday environment I attempt to juxtapose the constant tensions existing between my environment and myself. Garth Erasmus: THRENODY [on the death of Madi Phala] represents a personal station on a quest to develop alternative artistic practice. It deals with presence, absence and placement in the site-specific context of ReCenter. It is conceived as an aural architecture radiating outward from a corner to create a point of convergence, a counterpoint to the visual works present.It is dedicated to the memory of Madi Phala. Xolile Mtakatya: Basically the work reflects the portraits of so called foreigners in this continent, brothers and sisters, young and old, who South Africans treat in a xenophobic manner, calling them names. To me the basic approach to anyone is to greet, in whatever language the person speaks, getting to know each others culture. Otherwise in Afrika we don’t debate issues that help each other better.The power figure, with hope and fear depicted/ written in different languages, and the power the figure itself has in protecting brothers who cross the borders… it’s unacceptable they are called kwiri kwiri. The horns are laid in the centre of the power figure Nkisi.Horns were used in ancient African times to call people to gather. They symbolize calling upon others to gather, and talk about the challenges that we face. Mario Pissarra: 55 Centres of Power refers to the official capitals of 53 African countries. The names of these capitals are replaced with the names of the most populous cities of a formerly colonizing power. 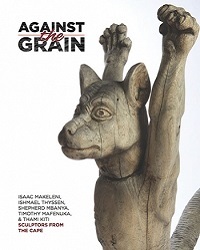 55 Centres of Power aims to stimulate discussion on the impact of colonialism on Africa. It poses the question of the relevance of the discourse of decolonization in contemporary ‘post-colonial’ Africa, not least in the visual arts. Whilst seeking to question notions of power, past and present, 55 Centres of Power simultaneously aims to affirm the potential of Africa in developing its own infrastructure. The curatorial concept was discussed with individual artists who proposed particular interventions. 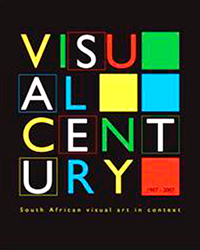 New work was produced specifically for ReCenter by Garth Erasmus, Randolph Hartzenberg, Mario Pissarra and Xolile Mtakatya, while Donovan Ward and Ernestine White adapted ongoing work for the exhibition. Pre-existing work by Gerry Dixon and Randolph Hartzenberg (Somewhere/Nowhere) was also included.The walls were painted white to introduce more light. The sinks and wall fittings, floor designs and zinc sheets were all part of the existing infrastructure. 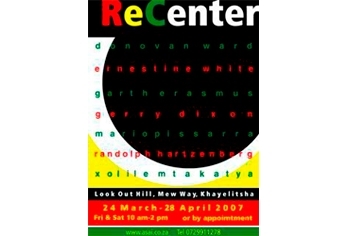 Acknowledgments: ReCenter was resourced by the participating artists. Thank you to the City of Cape Town and management at Look Out Hill for the free use of the space, and for allowing us to paint the walls and to remove some of the fixtures. Thanks to Siyazama, Martin Yongo, and all the crafters and traders who were inconvenienced by our exhibition; to Cape Africa Platform/ X Cape for assisting with marketing; and to Lenore Cairncross for photos.